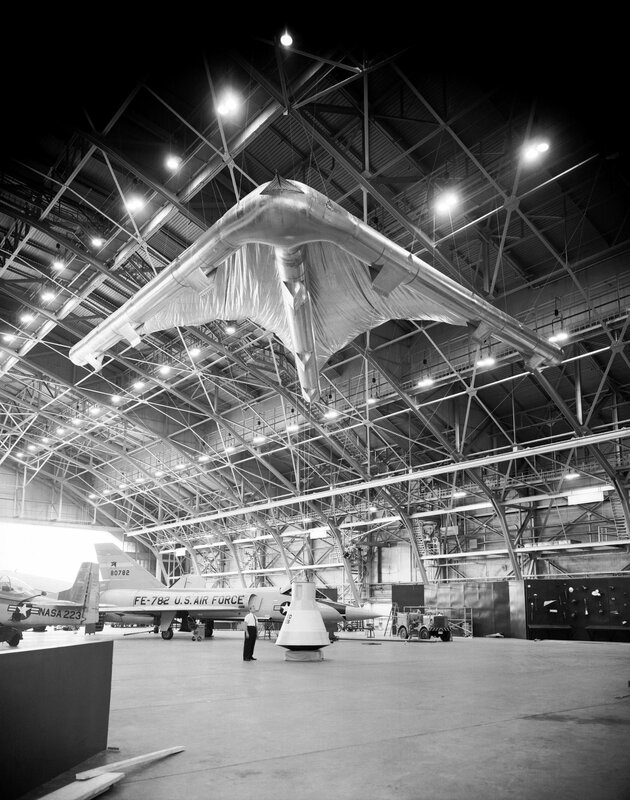 Beginning with its initial development in 1961, the Rogallo wing had a long and interesting history within NASA. For the moment, I will limit myself to its inclusion in Gemini, putting the system’s research and development timeline against the Gemini program as a whole. This will begin to unravel why, in spite of NASA’s best efforts, all Gemini missions ended in splashdown. The method was also labour intensive. The Naval forces on hand to recover one Mercury astronaut were significant ranging from eight to twenty-seven ships per mission for the duration of the program. Additionally, the passive role of the astronaut during landing had been a point of contention. They had been fighting for full control over their spacecraft since the beginning of Mercury. The move to a pilot-controlled landing on land was a desirable one all around. But bringing astronaut-controlled landings into the Gemini program was slightly easier said than done. Originally designated as Mercury Mark II, the Gemini spacecraft was a larger version of Mercury mimicking it in shape and size. Like its predecessor, Gemini was a blunt body capsule with an ablative heat shield over its larger end. It was also inherently non-aerodynamic. The Rogallo wing had the difficult task of turning the blunt capsule into a glider. Controlling the mated capsule and paraglider necessitated an entirely new way of flying. The sail didn’t turn the spacecraft into a traditional aircraft so there were no ailerons or rudders for control. Because it flew in the atmosphere, ballistic controls like those used during orbit or the upper atmospheric portions of an X-15 flight were of no use. It also wasn’t quite a glider. The wing generated some lift, but not enough to work on its own. The astronaut controlled the mated spacecraft and paraglider by manipulating the cables that connected the spacecraft to the sail. By changing the wing’s angle relative to the capsule it would generate lift. This would shift the mated configuration’s centre of gravity and change the path of the capsule’s fall by altering its angle and direction of descent. Continual changes to the angle of the wing built up momentum and greater range of movement of the descending spacecraft, enabling the astronaut to gain significant control over his landing. Gemini would land on small wheels deployed on the underside of the spacecraft (relative to the position of the paraglider) on a runway. Contracts for the spacecraft and the paraglider wing were awarded to McDonnell Aircraft and North American Aviation (NAA) respectively in late 1961. The former was a beneficial arrangement. McDonnell was also building the Mercury capsule and had been developing a larger version that would become the basis for the Gemini spacecraft. With the preliminary development underway, it was simple for the contractor to include the capacity for the paraglider wing in at the earliest stages of Gemini’s construction. There would be no need to retroactively modify the spacecraft to incorporate the landing system. 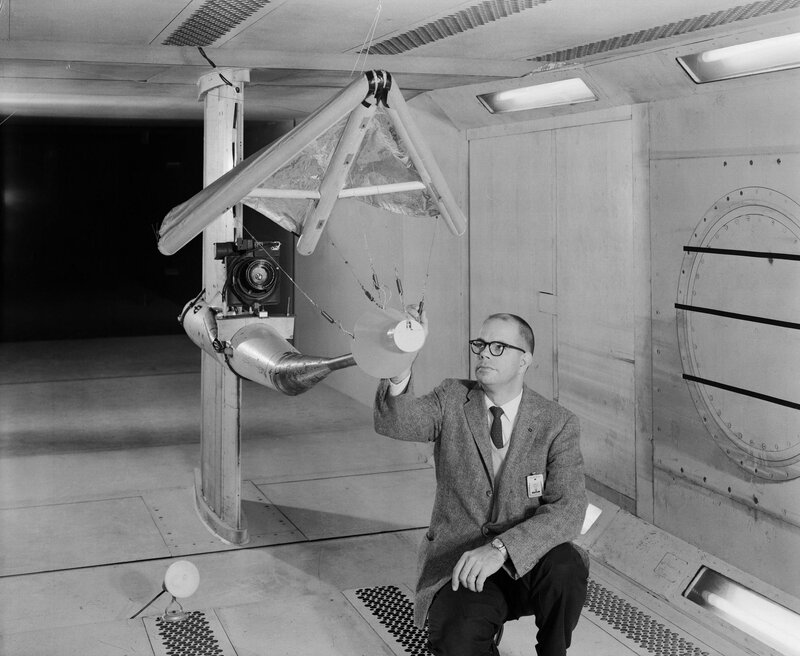 Models were also tested in wind tunnels at NASA’s Ames Research Laboratory. These tests yielded more measurable data on the paraglider’s performance. The amount of lift produced could be determined by measuring the speed of the air moving below and on top of the wing. This initial battery of tests yielded an equal mix of successes and failures. The failures, however, were significant. 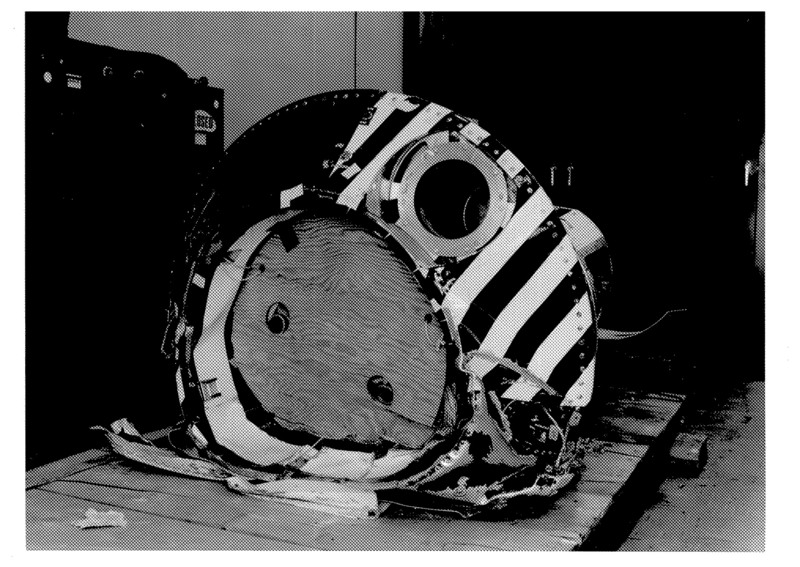 Most problematic was the sail’s tendency to disintegrate in wind tunnel tests, suggesting that structurally it might not be a flight worthy design. But the major failures were overlooked, explained away as only occurring during tests that pushed the design to its limits or mimicked far more severe conditions than anything NASA would permit a manned spacecraft to land in. After all, the astronaut’s ability to avoid dangerous landing conditions was one of the motivators behind a pilot-controlled landing system. The flaws revealed by these initial tests were not serious enough to kill the paraglider program altogether. The failures were fixable, and the successes weighed heavier. 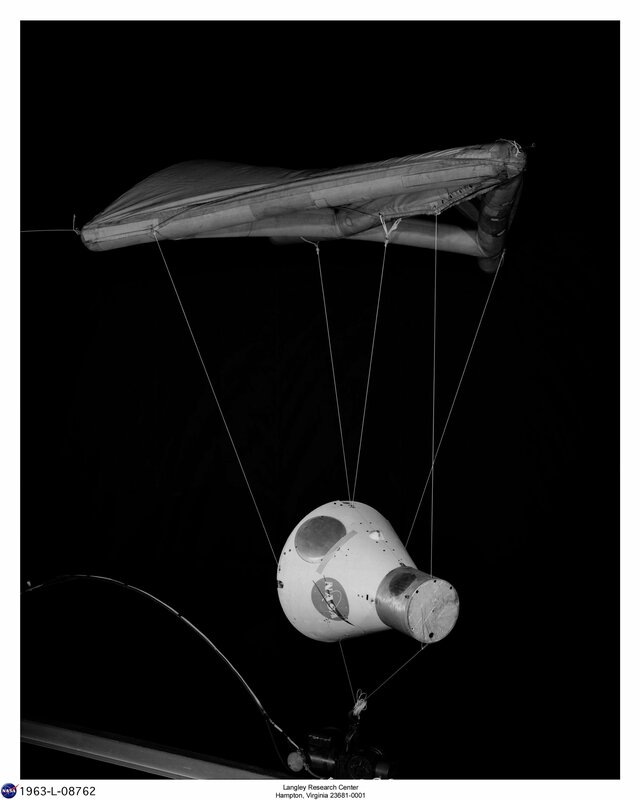 Following minor design changes, the system’s development was hastened and a successful paraglider landing was upgraded to a primary program objective. Success early in its development inspired great confidence in the paraglider system. But success proved fleeting as continued testing brought an increasing amount of failures. The wing’s structural problems persisted. Further drop tests saw more sails fall apart and in some cases the backup parachute also failed. More than one test vehicle was lost to a crash landing. This delayed the program as subsequent tests had to get at the root of the problem before development continue. Wing deployment tests were also proving problematic. The sail wasn’t deploying consistently, at times not opening fully and failing to inflate with enough time to produce sufficient lift for a soft, controlled landing. If the sail didn’t open at a high enough altitude, a successful landing would be impossible. The mounting problems also led to a contractual renegotiation between NASA and NAA. 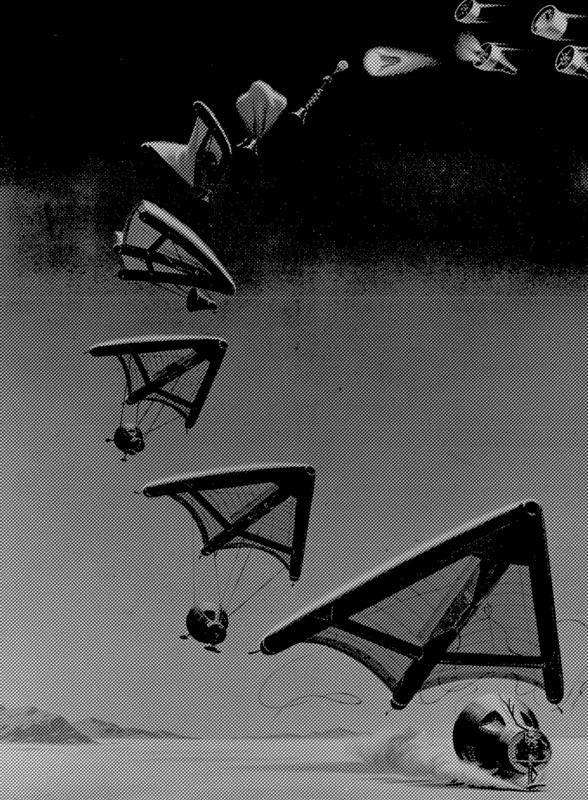 The revised contract in 1963 stipulated that NAA complete the development of the paraglider and deliver a working system to NASA. 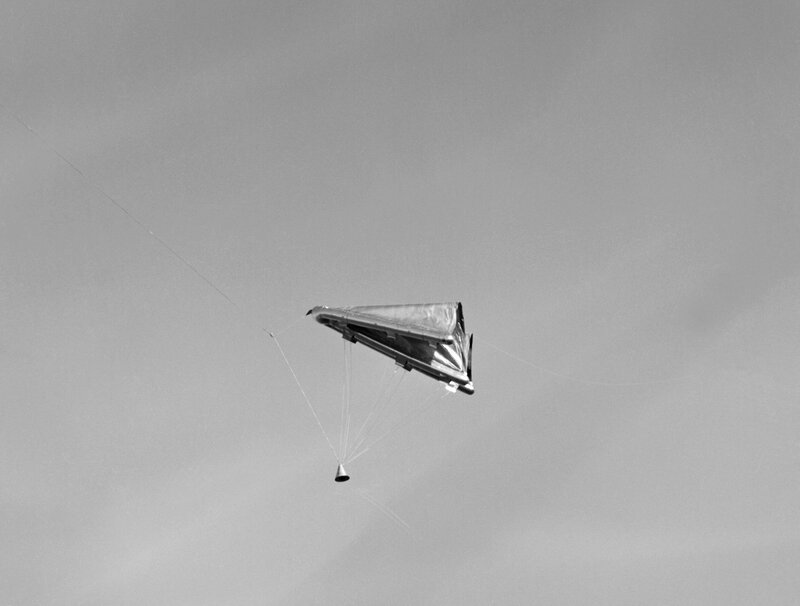 The wing-sail design was to be modified for optimal deployment and a test program was to be completed using both half- and full-scale tests. The new contract made no mention of either including the paraglider system into the Gemini spacecraft or of flying the system at all in any manned spaceflight program. At this point, the paraglider’s future inclusion in Gemini was increasingly unlikely, but the system on the whole was still deemed worth pursuing. Compounding the problems surrounding the paraglider’s development was NAA’s conflict of interest with its other NASA contract – in 1962, NAA won the bid to build the Apollo command module, a much more important piece of hardware in the grand scheme of things. 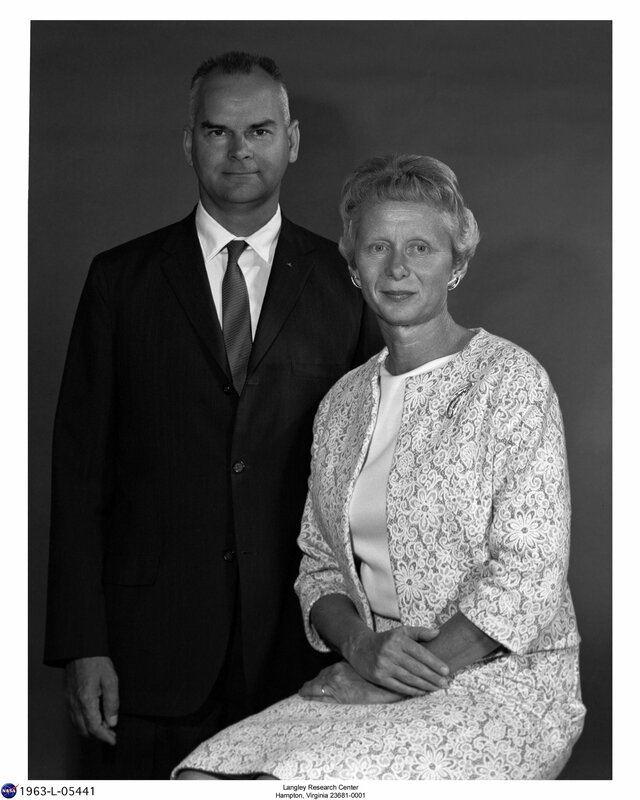 The company only had so many employees, and the majority of its resources were quickly diverted to Apollo as a priority. On February 20, 1964, NASA Associated Administrator George Mueller killed the Rogallo wing as far as the Gemini program was concerned. 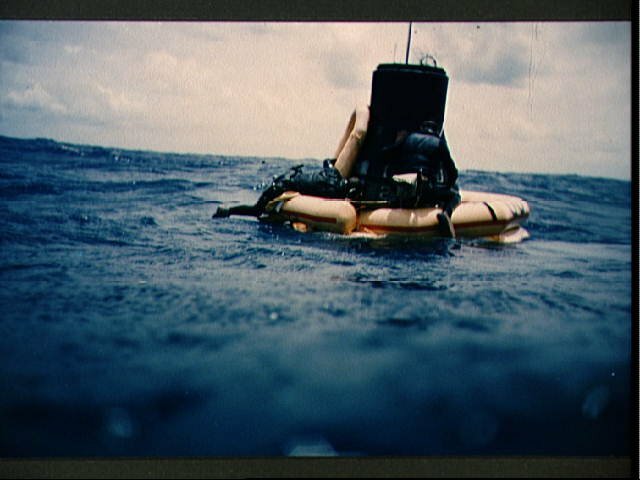 He announced to the Gemini Program Office that all twelve Gemini flights – two then-completed unmanned and ten scheduled manned missions – would end with splashdowns. As though holding out for some miracle, the Gemini quarterly report for the period ending in February 1964 still listed paraglider landings as the mode for the last three missions. From that point on, the paraglider’s death was swift. In May 1964, NASA and NAA agreed to pursue the paraglider for flight test purposes only; there was again no mention of any manned flights. In June, Gemini Program Manager Charles Matthews removed the paraglider as a program requirement. The last mention of the paraglider in the official Gemini program history is a cursory remark from December of 1964, three months before the first manned mission, Gemini 3. Each failed test necessitated further testing to determine the problem, which led to fatal scheduling delays. Another contributing factor is the tight time frame associated with the program. The looming lunar goal effectively made Gemini into a crash program like Mercury – it answered an immediate need through crude means, but it got the job done. Although the paraglider was scrapped from Gemini in 1964, it didn’t disappear right away. Having spent significant time and money developing the system, NASA was determined to put the glider to good use. The Rogallo wing wasn’t put to rest until the mid-1970s. In the interim period, there was talk of using the method to land Apollo, and the US Air Force considered using the system in its military space ventures. The Rogallo paraglider’s story, as well as the stories of the men who built and tested it, will continue in future posts. 4. Hacker and Grimwood. On the Shoulders of Titans: A History of Project Gemini. Washington: NASA. 1977. 5. “The Gemini Program” – The John F. Kennedy Space Center. http://www-pao.ksc.nasa.gov/kscpao/history/gemini/gemini.htm. Revised March 10, 2004. [Accessed October 2, 2009]. 6. Francis M. Rogallo. “Paraglider Recovery Systems”. NASA Archives, Washington D.C.
7. Jim Chamberlin “Draft on Gemini Land Landing Systems”. NASA Archives, Washington D.C. Thank you, Ms. Teitel, for doing the most thorough research I’ve come across on the trials and tribulations of the attempt to make Rogallo wing recovery work for Gemini. I’ve been working on an alternative space history writing project, and had just about settled on reusable Big Gemini capsules, landed under Rogallo wings, as the “replacement” for the never-developed STS (at least, in my “version” of history). Guess I’ll reconsider that! I’ll be following future issues of your blog, with interest.